To Cite: Avtan L, BernardCadière G, Avcı C. Laparoscopic Surgery Education and a Multinational Project for Distance Learning, J Minim Invasive Surg Sci. 2013 ; 2(4):-. Objectives: The main objective is to promote the exchange of knowledge about videoscopic surgery and establish a surgical network with a high quality moving image over the broadband internet access. Materials and Methods: Having the “Portable Wireless Live Video/Audio Transmission System (IMD) and using Digital Video Transport System (DVTS) and the audio and video content from the operation room or meeting room can be transmitted easily to the remote sites. Results: Surgeon applicants who have a computer and basic internet connection will be easily connected online to the operation and conference rooms, and follow in real time and even use it interactively. Discussions: Low-bandwidth, internet-based telemedicine is effective and inexpensive. Surgeons living in remote areas, distant countries and especially those with limited resources , can follow the videoscopic courses, meetings, and live surgeries organized by experienced centers, on their computer screen, in real-time and interactively. Videoscopic surgery is one of the most important innovations in surgery, and has brought great benefit to patients thanks to its minimally invasive character. Since the first laparoscopic cholecystectomy performed by Dr. Mouret in Lyon in 1987, it was great progress both technically and operationally. Nowadays, it is possible to achieve almost all operations via videoscopy by experienced surgeons. Besides, Education and Training have also been tremendously influenced, with a completely point of view at the problem. From the outset, the training and education of this new surgery were the first to solve problems for novice surgeons. The initial and advanced courses were practically the only ways to learn this new surgery, for senior and junior surgeons who were trained previously in conventional surgery. Then the videoscopic surgery was taught during the internship, so the initial courses not so considered. To this day, there are several training centers in different countries which continue to teach and train videoscopic surgery, organizing the advanced courses with live surgery and other educational activities. The European School of Laparoscopic Surgery-E.S.L.S. at the Saint-Pierre University Hospital in Brussels directed by the Professor Guy-Bernard Cadière has been established for more than 18 years and is one of the oldest and the most important Schools of laparoscopic surgery in Europe. The very best experts of the world have come to teach there. Since its beginning, over 5000 fellows and surgeons have passed the courses. For years, these courses are endorsed by the Society of American Gastrointestinal and Endoscopic Surgeons (SAGES) and by the European Association for Endoscopic Surgery (EAES). The Medical Education and Research Center of Istanbul University- ISTEM directed by the Professor Levent Avtan, is also one of the best known, a very active academic center for telemedicine, education and teaching at distance in the country. The center has a meeting room with telemedicine links to the operating rooms of the hospital situated in our campus (Istanbul Çapa Hastanesi), other hospitals in Turkey and different countries for periodic educational courses and others activities. It has a meeting room linking directly to the operating rooms of the hospital and a teleconference system connecting the ones of other hospitals in Turkey and in different countries abroad with telemedicine. The Turkish Association of Endoscopic Laparoscopic Surgery – ELCD, whose President is Professor Cavit Avci, a pioneer in videoscopic surgery, has a leading position to teach and train the minimally invasive surgery in Turkey. ISTEM and ELCD decided to teach surgeons how to perform minimally invasive surgical procedures since 1992 in Turkey. They organized periodical videoscopic surgery courses (basic and advanced) and have trained more than a thousand of surgeons giving each of them a certificate endorsed by the Istanbul University and the European Association for Endoscopic Surgery (EAES). In basic laparoscopic surgery courses, it is important for the participants to have workshop practice in a trainer box as well as live surgical practice on animals like pigs, before performing on the patients. On the other hand, the telecommunication technology has made great strides in recent years. Tele-teaching and distance learning has taken a great importance and was well suited for the education and training of surgery (1, 2) . Accordingly, in the last ten years, applications of tele-conferencing, tele-assisting and tele-mentoring have been successfully used, during our videoscopic surgery courses. In tele-mentoring application, the surgeon performing the laparoscopic surgery on a patient for the first time is supervised by an experienced surgeon via visual and audio connection. Thus, the operating surgeon who has less experience, can benefit from the knowledge of the experienced surgeon by interacting with him in real time connection. By this way, the practicing surgeon is gaining experience on the new techniques while performing the live surgery in a safe and secure manner. On the other hand, the new laparoscopic techniques performed on patients, by professional centers like “ European School of Laparoscopic Surgery in Brussels” and other centers, are shown and during the advanced courses and by using online Tele-transmission system, they trained surgeons from distance. The main objective was to promote the exchange of knowledge about videoscopic surgery and establish a surgical network with a high quality moving image over broadband internet access. Doing sufficient experiments, we decided to consider a Multi-National Project as a training center in distance videoscopic surgery in different applicant countries, especially Euro-Mediterranean, with the supports of “webtelesurgery.com" platform with regard to the two training centers in Brussels and Istanbul (Figure 1). 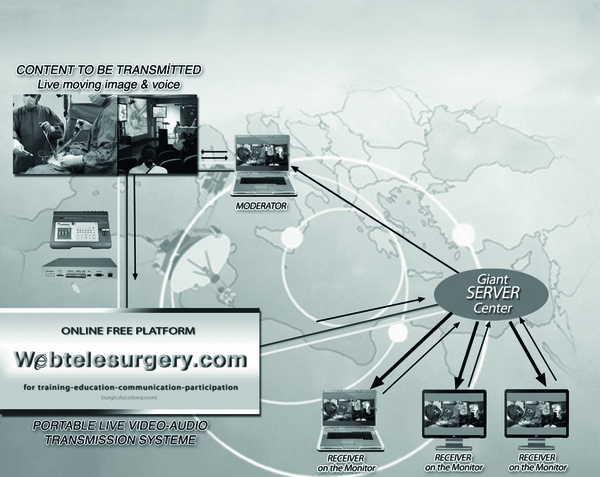 “Webtelesurgery.com” is an online free platform for training-education-communication-participation of surgery, especially videoscopic surgery. It has been created by Prof. Cavit AVCI and ISTEM team in Istanbul and is managed by an “International Educational and Evaluation Board”. Its main objective is to edit and expand the medico-surgical knowledge, in collaboration with major Scientific Associations and Centers of Excellence in Europe “a low-bandwidth internet-based system” was selected assuring the online tele-transmission in an optimal quality of video-audio, as well as the required interactivity for learning (3). Using "Webtelesurgery”, we have established a partnership with MMESA (Mediterranean and Middle-eastern Endoscopic Surgery Association) to distribute courses or specific educational sessions organized by our team. MMESA gathers 36 Countries around the Mediterranean Sea and the Middle East. It is an open association and other countries from Africa, the Black Sea region or Central Asia have also joined to this center. Using "Webtelesurgery” platform, we would like to establish a partnership with MMESA (Mediterranean and Middle-eastern Endoscopic Surgery Association) to distribute courses or specific educational sessions organized by our team the other country's team, with the evaluation and permission of the Board of platform. All the applicant countries around the Mediterranean Sea and the Black Sea, the Middle East, Africa, and Central Asia region can also joine this project. We are connecting the operating rooms and conference room via hospital network which will be connected to our “Portable Wireless Live Video/Audio Transmission System (IMD). We usually use Digital Video Transport System (DVTS) to convert directly the digital video signals to Internet Protocol format without any analog conversion there is a need to mention that the quality of the image won’t be lost. The DVTS is a kind of software used for sending and receiving digital video streams through the internet. It uses differentiated data transmission to send full-resolution video images to remote sites. It is an open source freeware that can be downloaded from the web site ( 4 - 6 ). We can connect the operating rooms and conference room via hospital network which will be linked to our “Live Video/Audio Transmission System. The video content will be sent via the broadband internet dedicated, minimum 1, beter 2 Mbps, to our giant main server, and then, everything will be distributed to individual receivers (Figure 2). Surgeon applicants having a basic internet connection must register in advance to get an access code. By this code, they will be easily connected online to operation and conference rooms and thus follows the surgery in real time and even interactively (if they want they can ask questions by phone or chat). Today, videoscopic surgery is widely used in the world and its trainings still important. Telemedicine and Distance Education have predominant role in training of surgeons, particularly in videoscopic surgery. Europeen School of Laparoscopic Surgery (E.S.L.S.) in Brussels and ISTEM & E.L.C.D. in Istanbul, are well-known in their respective countries, in Videoscopic Surgery. Those three institutions have recently created a project about tele-training and tele-teaching. They would like to make a contract with MMESA (Mediterranean and Middle Eastern Endoscopic Surgery Association) for doing videoscopic surgery from distance places. The courses and activities in well-known European institutions, using webtelesurgery.com platform, are sent by broadband internet system to the countries of MMESA. The applicant surgeons can be connected very easily to be able to use the courses and trainings at a very low cost effect, needing a computer and simple internet connection. This is why we are expecting a very good progression and continuation for this surgical method. Low-bandwidth, internet-based telemedicine is effective and inexpensive  . Surgeons living in remote areas, distant countries and especially those with limited resources , can follow the videoscopic courses, meetings, and live surgeries organized by experienced centers, on their computer screen, in real-time and interactively. Implication for health policy/practice/research/medical education: The present study promotes the exchange of knowledge about the videoscopic surgery and establishes a surgical network with a high-quality moving image over the broadband internet access. Authors’ Contribution: There is no one contributed in this journal.